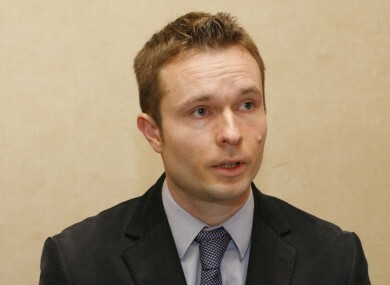 Cian O’Callaghan says that the party’s future is ‘grim’ unless the ‘authoritarian’ leadership listens to party members. ANOTHER HIGH-PROFILE member of the Labour Party has resigned. Cian O’Callaghan was the Mayor of Fingal County Council up until June this year, but says that he feels that he had to leave the party because it has ‘strayed from its roots’. O’Callaghan joins MEP Nessa Childers, who resigned from the party on Tuesday, and Meath councillor Jenny McHugh, who jumped ship to Fianna Fáil on the same day. Former junior minister Róisín Shortall said that she was now “semi-detached” from the party, but would not confirm that she was considering leaving the party. The Howth-based councillor was one of four Labour representatives to speak out against joining a coalition government with Fine Gael in 2011, but feels that things have turned out worse than he had initially feared. “I don’t take a black-and-white view of what Labour has done in government. It is contributing, but it has strayed from it’s roots as a centre-left party by imposing taxes and cuts on lower- and middle-class citizens. I didn’t anticipate that things would be as bad as it has been. Of course, there has to be compromises, but it hasn’t been fair at all. O’Callaghan rejected the notion that Labour’s slide in the polls is the price of doing business as the junior partner in the coalition. “It’s inevitable at all. There are plenty of countries in which a left leaning party goes into Government and makes better choices. “In the past, there was much more backbone in the Labour Party in government. I do feel that the party is lacking backbone in government now. As for the future of the party, O’Callaghan says that a change of attitude from leadership is necessary. “[The future] is grim enough if the leadership can’t engage with the criticism that it is facing, rather than ignoring it. “There is an authoritarian leadership that won’t engage with members of the party or representatives. They simply say that they are right. “There is nothing to be feared from discourse if you truly believe what you are doing is right and necessary. I was at a meeting with Eamon Gilmore about 18 months ago, where he came out to meet party members in North Dublin and he shouted down members who raised issues and criticisms. O’Callaghan says that while he believes a new party for the mainstream left could work, he has not spoken to any other public representatives who have left the Labour Party. Ultimately, he says it was a ‘reluctant decision’ to walk away. “My doubts started over the last two budgets, because the party increased income inequality. “I have tried to work to reform the party, but it hasn’t worked. I have no more positive energy to give, it was like banging your head off a brick wall. Email “"Labour is lacking backbone" - former Mayor of Fingal leaves Labour Party”. Feedback on “"Labour is lacking backbone" - former Mayor of Fingal leaves Labour Party”.